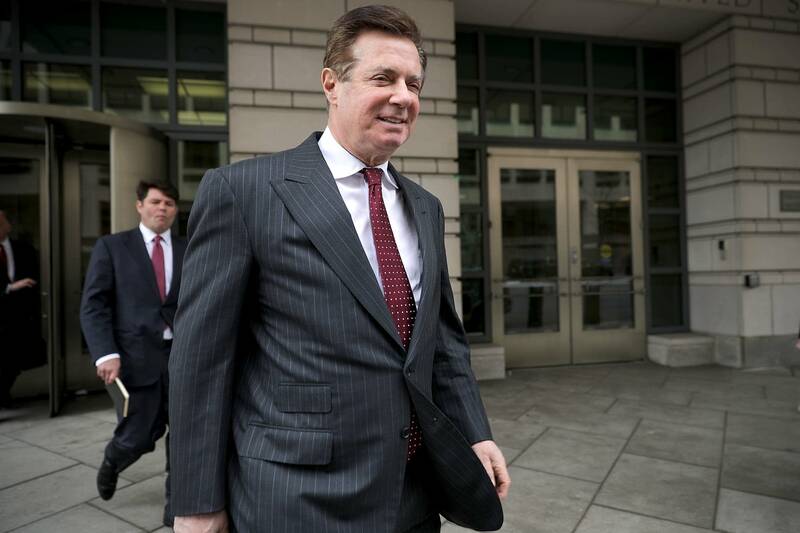 Updated: 5:58 p.m. | Posted: 11:09 a.m.
Paul Manafort, the longtime political operative who for months led Donald Trump's successful presidential campaign, was found guilty of eight financial crimes Tuesday in the first trial victory of the special counsel investigation into the president's associates. The verdict was part of a stunning one-two punch of bad news for the White House, coming as the president's former lawyer, Michael Cohen, was pleading guilty in New York to campaign finance charges arising from hush money payments made to two women who say they had sexual relationships with Trump. The jury returned the decision after deliberating four days on tax and bank fraud charges against Manafort, who led Trump's election effort during a crucial stretch of 2016, including as he clinched the Republican nomination and during the party's convention. Manafort, who appeared jovial earlier in the day amid signs the jury was struggling in its deliberations, focused intently on the jury as the clerk read off the charges. He stared down blankly at the defense table, then looked up, expressionless, as the judge finished thanking the jury. "Mr. Manafort is disappointed of not getting acquittals all the way through or a complete hung jury on all counts," said defense lawyer Kevin Downing. He said Manafort was evaluating all his options. The jury found Manafort guilty of five counts of filing false tax returns on tens of millions of dollars in Ukrainian political consulting income. He was also convicted of failing to report foreign bank accounts in 2012 and of two bank fraud charges that accused him of lying to obtain millions of dollars in loans after his consulting income dried up. The jury couldn't reach a verdict on three other foreign bank account charges, and the remaining bank fraud and conspiracy counts. The outcome, though not the across-the-board guilty verdicts prosecutors sought, almost certainly guarantees years of prison for Manafort. It also appears to vindicate the ability of special counsel Robert Mueller's team to secure convictions from a jury of average citizens despite months of partisan attacks, including from Trump, on the investigation's integrity. The verdict also raised immediate questions of whether the president would seek to pardon Manafort, the lone American charged by Mueller to opt for trial instead of cooperate. The president has not revealed his thinking but spoke sympathetically throughout the trial of his onetime aide, at one point suggesting he had been treated worse than gangster Al Capone. The president Tuesday called the outcome a "disgrace" and said the case "has nothing to do with Russia collusion." The trial did not resolve the central question behind Mueller's investigation -- whether Trump associates coordinated with Russia to influence the election. Still, there were occasional references to Manafort's work on the campaign, including emails showing him lobbying Trump's son-in-law Jared Kushner on behalf of a banker who approved $16 million in loans because he wanted a job in the Trump administration. Manafort urged Kushner to consider the banker, Stephen Calk, for Secretary of the Army. Though Kushner responded to Manafort's email by saying, "On it!" Calk ultimately did not get an administration post. For the most part, jurors heard detailed and sometimes tedious testimony about Manafort's finances and what prosecutors allege was a years-long tax-evasion and fraud scheme. His defense team attempted to make the case about the credibility of longtime Manafort protege Rick Gates, attacking the government's star witness as a liar, embezzler and instigator of any crimes as they tried to convince jurors that Manafort didn't willfully violate the law. Gates spent three days on the stand, telling jurors how he committed crimes alongside Manafort for years. He admitted to doctoring documents, falsifying information and creating fake loans to lower his former boss' tax bill, and also acknowledged stealing hundreds of thousands of dollars without Manafort's knowledge by filing fake expense reports. Beyond the testimony, prosecutors used emails and other documents to try to prove that Manafort concealed from the IRS, in offshore accounts, millions of dollars in Ukrainian political consulting feeds. Overall, they said, he avoided paying more than $16 million in taxes. Central to the government's case were depictions of an opulent lifestyle, including a $15,000 ostrich jacket, luxury suits and elaborate real estate that prosecutors say was funded through offshore wire transfers from shell companies in Cyprus and elsewhere. U.S. District Judge T.S. Ellis III repeatedly grew impatient with prosecutors as they sought to demonstrate Manafort's garish tendencies. The clashes between the judge and the prosecutor became a sideshow of sorts during the weeks-long trial, with the judge at one point appearing to acknowledge that he had erroneously scolded them. After the trial, Ellis complimented lawyers on both sides for "zealous and effective representation." He also remarked on his surprise at the level of attention the case has received and the criticism he received for his management of the trial. "We all take brickbats in life," Ellis said.